We had a small flock of 20-30 Shetland sheep on our farm from 2003 to 2015 when we sold all but four, which we are keeping as “school sheep” for educating people about wool. We chose them because of their small size, fine wool, naturally colored fleeces, docile temperament, easy lambing and wonderful mothering instincts. In 11 years of lambing, only two ewes ever needed assistance. They are one of the oldest breeds of sheep, and as such, they retain many of the wonderful characteristics that we prize at Antiquity Oaks. They also thrive on pasture alone, unlike some of the modern breeds. Another reason we prefer the Shetlands is because they have naturally short tails, which are not docked. We use our Shetland wool to spin into yarn and then make scarves and sweaters for ourselves. We also sell raw fleeces, roving, and yarn, as well as rugs. In 2015, we bought three pregnant hair sheep. They were Katahdin and Dorper crosses. In 2016, we bought a purebred Katahdin ram, as well as a few more ewes. 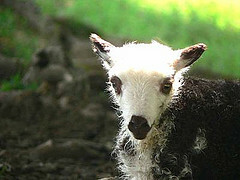 As they are hair sheep, we raise them for lamb meat.